Placed at a right angle to the bedroom wing so it faces north, the open plan living room contains kitchen, dining and sitting areas, with a covered outdoor room at the eastern end. The bed packs away into the wall in the combined study and guest room. Picture windows – one with an inviting window seat and open shelving – frame views of the garden and farmland beyond, while banks of sliding glass doors allow breezes to enter for cross ventilation. 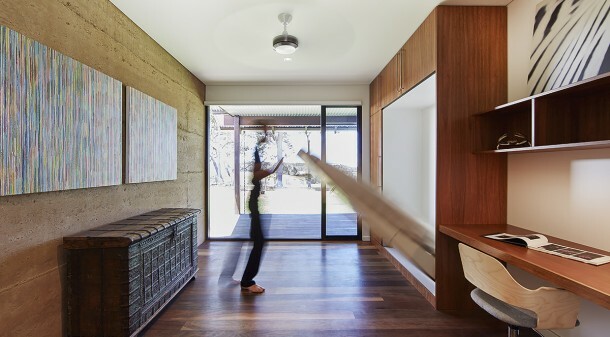 The rammed earth wall stretches through the house and works in concert with concrete floors in the living area to provide thermal mass. The house is divided into two parts, each with pitched roofs and timber cladding to resemble traditional barns. The garden is wild and luxuriant and has distinctive themes: under the verandah there is a perfumed garden with gardenias and gingers. 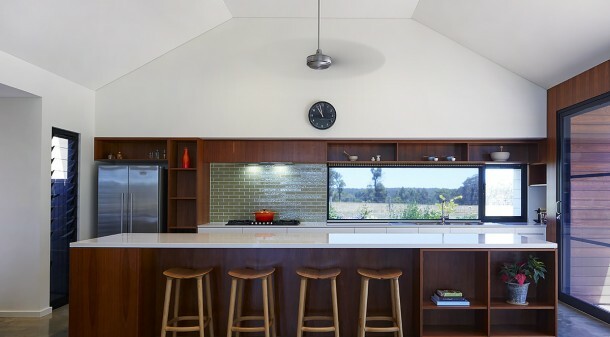 Living in the country may seem charming and idyllic to some, but Pamela O’Reilly endured many climatic extremes before building a modern farmhouse near Margaret River. Pamela shelved their plan to grow grapes and continued raising beef cattle instead, calling on her son Paul, who lives next door, and daughter Jennifer, who lives in Margaret River, to help run the business. Three years ago, after decades of driving back and forth to Perth, Pamela decided to embrace country life full-time. 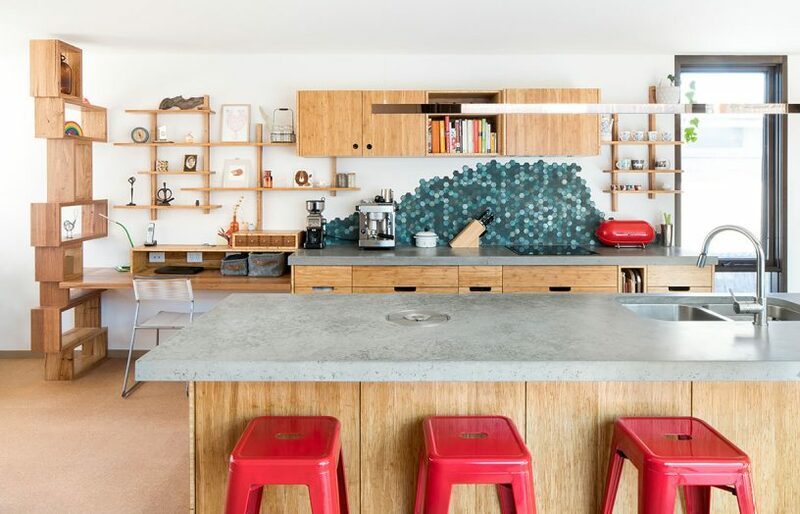 She commissioned Paul, who is also an architect and lives in a home he designed and built for himself, to design her a modern farmhouse. Taking into account his mother’s wishes, Paul divided the house into two parts – both with pitched roofs and timber cladding, to resemble traditional barns – separated by a flat-roof section. 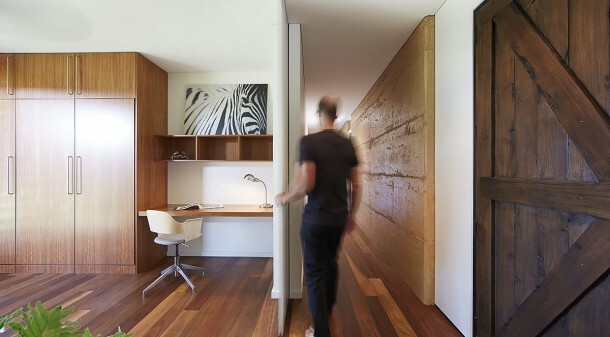 It contains the main entry and a combined study and guest room. “Essentially I split the house into two pavilions, and located the bedrooms on the southern side to face paddock views to the east, with a traditional verandah providing shaded spaces off that wing,” Paul says. To the right of the main entry, the bedroom wing boasts a wide hallway with a rustic aesthetic, thanks to the rough-hewn recycled Oregon front door, which segments a long rammed earth wall. 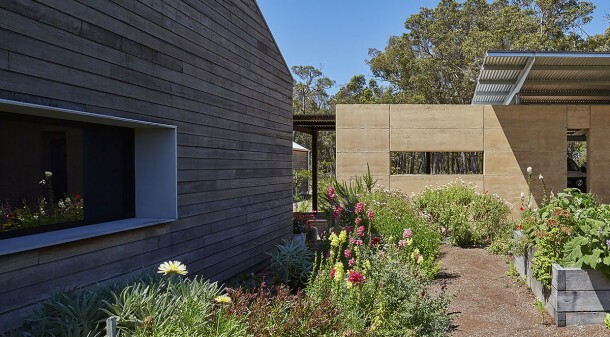 Formed and compacted in place, the rammed earth works in concert with concrete floors in the living area to provide thermal mass. Placed at a right angle to the bedroom wing so it faces north, the open plan living room contains kitchen, dining and sitting areas, with a covered outdoor room at the eastern end. Two picture windows – one with an inviting window seat, the other surrounded with open shelving – frame views of the garden and farmland beyond, while banks of sliding glass doors allow breezes to enter for cross ventilation. 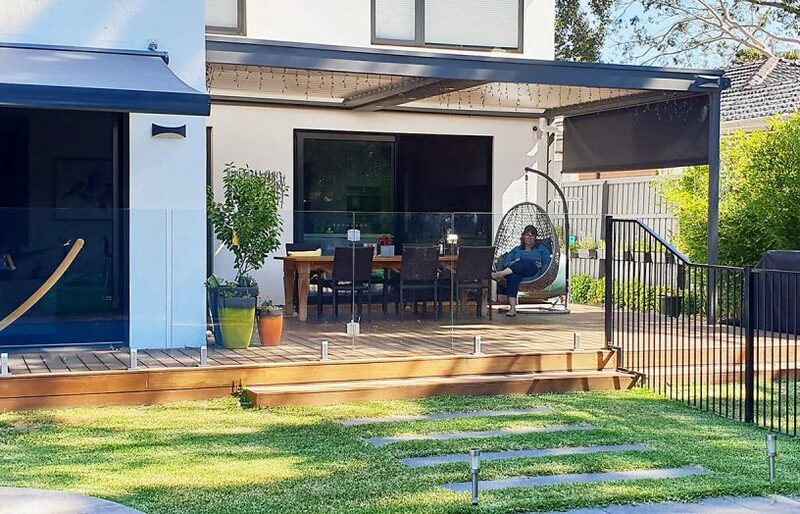 Outside, Pamela has nurtured a thriving series of garden rooms from a once bare paddock, battling grasshoppers, weevils and long spells without rain. She’s always been a keen horticulturist but had never started a garden from scratch before, and admits the prospect was slightly daunting. 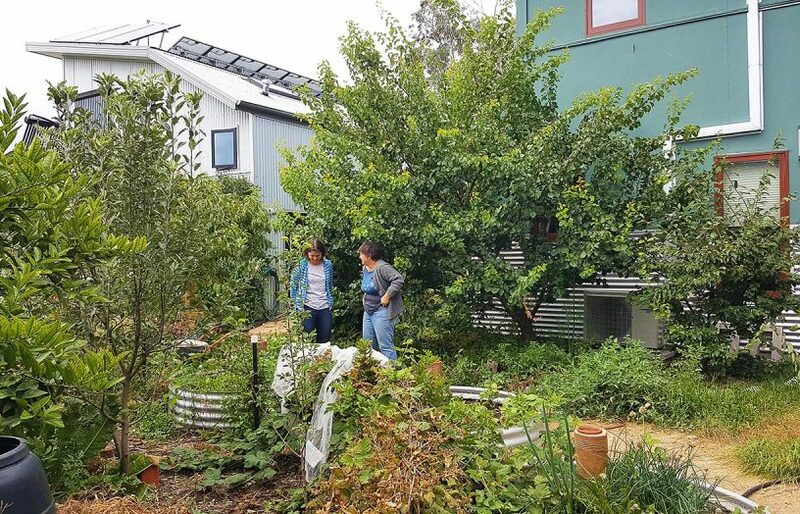 “I found it easier to tackle once Paul laid out a series of winding paths with large granite borders, and plant beds and raised vegetable boxes,” she says. Despite being just two years old, and therefore “still in its infancy”, the garden is wild and luxuriant with a riot of coloured flowers that attract bees and native birds. Distinctive themes outline separate zones: a perfumed garden with gardenias and gingers nestles below the verandah; bushy natives occupy the western side between the carport and front door; a thicket designed to attract wrens sits just beyond the kitchen garden; an orchard marks the outer edge; and several ponds and water features are dotted throughout. The new house is easier and more efficient to run too, thanks to a host of sustainable design features including solar hot water and photovoltaics, rainwater collection and waste water treatment systems, a slow combustion fire that uses fallen timber collected from the property, and ceiling fans throughout. With its rough surfaces that hint at the former life of the recycled timber and bricks used in the build, and a spectacular location that makes the most of the climate and views, Pamela couldn’t be happier in her new abode, which she likens to permanent camping. 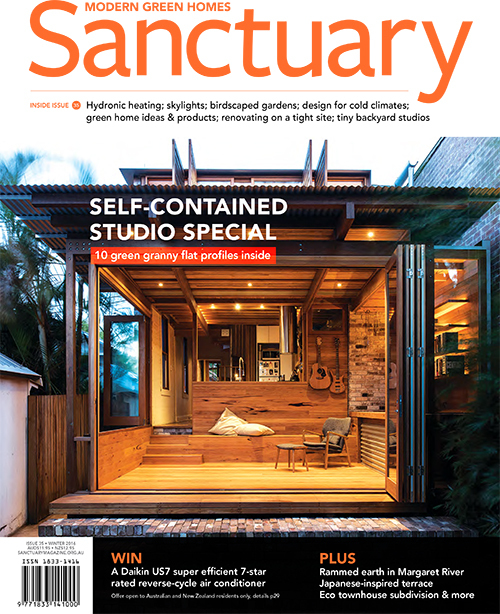 “I wanted a house that felt like being outside, but which was sheltered from the elements,” she says. Tearing down the backyard fence or installing a gate between your house and next door sounds good in theory, but what’s it like in reality?